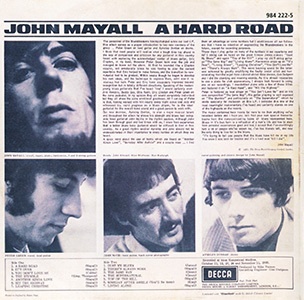 The question facing a perplexed John Mayall in July 1966 was “How do you find a replacement for 'God'?” The unconventional answer he came up with was, “Take a guitarist you've already hired and fired once, and try to persuade him to come back.” Strange as it seems, it worked, resulting in a Classic Album that's every bit the equal of its more famous predecessor. Peter Green had replaced Eric once already, when Clapton decided he could have more fun bumming around in Greece with some mates as “The Glands.” Mayall, trying out a variety of stand-in axemen, was repeatedly besieged by "this cockney kid, (who) kept coming down to all the gigs and saying, 'Hey, what are you doing with him; I'm much better than he is, why don't you let me play guitar for you?' He got really nasty about it,” Mayall recalled later to Guitar Player magazine, “so finally, I let him sit in." As it turned out, the precocious 19-year old wasn't bragging, and if not quite as good as 'God' already, he was certainly head and shoulders above the 'deps' Mayall had been using so far. Unfortunately, after Clapton “escaped” from Greece, the first thing he did when back on British soil was to ring up John and ask for his old job back. As Clapton's reputation was still that of the foremost Blues guitarist in the UK, returning this prodigal to the fold must have seemed like the obvious choice for Mayall, but Eric was to upset his former mentor's apple cart by quitting the Bluesbreakers to form Cream, before the LP bearing his name had even been released. To make matters worse, the news of his defection had been leaked to Melody Maker before he'd discussed his decision with John, and though he agreed to stay with the group until he could be replaced, as soon as he missed a few gigs, Mayall officially sacked him. But how would the Bluesbreakers fare without their star attraction? Meanwhile, tired of touring and dispirited by Clapton's departure, drummer Hughie Flint left the band, his final paycheck containing five pounds less than usual because, Mayall told him, “receipts had been down at recent gigs.” Brian Auger's sticks-man Micky Waller passed through the group on his way to Blues Inc., but Flint was more permanently replaced by Liverpool's Aynsley Dunbar, formerly with Stu James's band The Mojos, who were still gigging on the strength of their one-off Merseybeat hit, “Everything's Alright.” With bassist John McVie reinstated (again!) Mayall was able to start working up a new set of songs to which Green could make his own contributions, and avoid the Clapton comparisons. From the sleeve notes of “A Hard Road,” here are John's own reactions to the new songs and line-up. “ The personnel of the Bluesbreakers having changed since our last LP, this album serves as a proper introduction to two new members of the group ... Peter Green on guitar and Aynsley Dunbar on drums. I think that most people will realize what a tough time lay ahead in the way of comparison and criticism for any guitarist in this country faced with replacing the acknowledged master of blues guitar, Eric Clapton, in my band. However Peter Green took over the job and managed to brave out the storm. At first he sounded like a Clapton copyist, not unnaturally since he was having to play the current repertoire that Eric helped to make famous, and the transition to new material had to be gradual. Within weeks though he began to develop his own ideas, and the technique to express them, until now it is obvious that both Peter and Eric have separately improved beyond recognition but in totally different directions. Speaking of the modern young blues guitarists that I've heard 'live' I would certainly cram Jimi Hendrix, Buddy Guy, Otis Rush, Eric Clapton and Peter Green on the same pedestal. In my opinion they all sound completely individual but they all share the same emotional greatness. All I can say of Peter is that, having worked with him every night since last July and witnessed his rapid progress as a blues player, he is the ideal guitarist for the overall band sound and a great person to work with. Our new drummer, Aynsley Dunbar, is also a major musical talent and throughout the album he shows his strength and blues feel alongside bass guitarist John McVie in the rhythm section. Although John has been through good and bad times with us, I know from experience that a better blues bass guitarist would be difficult to find in this country. As a great rhythm section Aynsley and John should not be underestimated in their importance to every number on which they are heard. These days I play guitar on many of the numbers in our repertoire and my 5 string can be heard on the great Elmore James classic "Dust My Blues" and again "Top Of The Hill". I play my old 9 string guitar on "The Same Way" and "Living Alone". Harmonica crops up on "It's Over", and "Living Alone", "Leaping Christine", "You Don't Love Me" and "There's always Work." The weird backing sound for the latter was achieved by greatly amplifying the faulty pedal click and hum emanating from the organ tone cabinet whilst Mike Vernon, Gus Dudgeon and I did the chanting and moaning sounds. As it is almost impossible to use a piano for club appearances, I always look forward to using using one on our recordings. I overdubbed piano onto a few of these titles and featured it on "A Hard Road", and "Hit The Highway". Peter is featured as lead singer "You Don't Love Me" and on his own composition "The Same Way". His guitar playing is well exposed on "The Stumble" and particularly on "The Supernatural" which he wrote specially for inclusion on this LP. I consider this one of the most meaningful instrumentals I've heard and certainly stands as one of the highspots of the record. The music contained here means far more to me than anything we've recorded before and I hope you will find your own special favourite tracks from the many contrasting types of blues represented here. Blues in it's true form is a reflection of a man's life and has to stem from personal experiences good and bad. I accept that I've unwittingly hurt a lot of people who've known me, I've few friends left, and now the only thing to live for is the blues. Trk. 1) “A Hard Road.” Mayall's confessional title track finds him in a melancholy mood, his voice anguished and keening, as he bemoans the turns his life has taken. With ringing piano to the fore, the band is tight and powerful, and for a moment it sounds as if nothing has changed. Then comes the guitar solo, and it's immediately much more economical and understated than anything Clapton might have done in the same place. John's voice and Peter's guitar come to the top as the track fades, accentuating the feeling of isolation inherent in the lyric, a strong song, beautifully arranged and presented. Trk. 2) “It's Over.” This song about lost love is a driving shuffle, pushed along determinedly by the McVie/Dunbar rhythm section. Although the tone of a few guitar licks may seem familiar, the solo's taken by guitar and harp together, working like a horn section, while Dunbar throws in some excellent drum fills during the stops. Another fine cut, enhanced by Mike Vernon's warm, clear production. Trk. 3) Green picks Willie Cobbs' 1960 single “You Don't Love Me” as his first vocal with the band, and what a confident debut it is. He takes the number at a much faster tempo, concentrating on the catchy riff, and leaving the solo spot to John's capable harp, but the soulful voice which soon came to characterise Fleetwood Mac is already there. Like “All Your Love,” this version's become a British Standard that still pops up at gigs and jams. Trk. 4) Peter covers Freddie King's “The Stumble,” and all the weeks standing in for 'God' show here, as Green comes very close to the tone and phrasing that typified Clapton's “Beano” work. John's piano chimes and tinkles in the background, and the rhythm section drives effortlessly. Peter can still be heard playing this one today, though sadly without the fire evident on this evergreen version. Trk. 5) Mayall's tortured voice brings in the strangely dark “Another Kind Of Love,” as heavy brass and riffing organ accentuate a stop-start rhythm which is punctuated by Dunbar's prominent high hat. The guitar is virtually submerged in the mix, until Green delivers a harsh, biting solo, and the brass moves up a register for the final verse. The music creates an ominous feeling, and the subject matter's mysterious, is this “other kind of love” perhaps the one that dare not speak its name? A very moody piece, and sensitively produced. 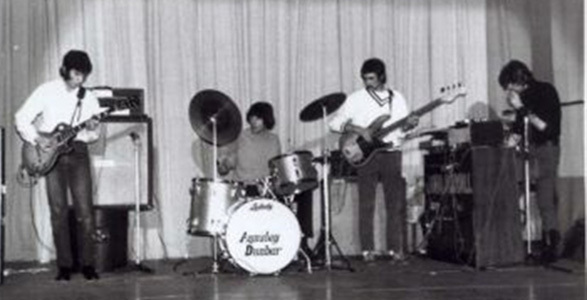 Dunbar used a similar fragmented rhythm, later, to write the haunting “Warning,” which became a 1967 Blue Horizon single for his own band, Aynsley Dunbar's Retaliation, and was covered by Black Sabbath on their debut album in 1970. Heavy! Trk. 6) “Hit The Highway” is a straightforward 12-bar shuffle with a double-tracked vocal and only piano and guitar accompaniment. A nice change of pace, with a pleasantly restrained guitar solo, though it doesn't gel quite as well as as the Mayall/Clapton duets. Trk. 7) “Leaping Christine” features double tracked vocals again, with John this time providing his own harmonies. After one twelve bar verse, it becomes essentially a long, one-chord harmonica and organ workout. Everything's thrown in, including brass, to such an extent that a lot of Dunbar's excellent drumming gets buried in the mix - not a bad track, but one that might have benefited from a more Spartan treatment. Trk. 1) “Dust My Blues,” was Elmore James' 1955 reworking of his 1951 “Dust My Broom,” and after his death was issued as a UK single on the Sue label in 1964, making the latter version fairly contemporary for the Mayall & Co. The Bluesbreakers' take on it is tremendously dynamic, with the beat driven along relentlessly by McVie & Dunbar, and two guitars attacking the riff simultaneously. Mayall's 5-string bottleneck adds an air of Country Blues authenticity, while Green's tone is cutting, and his solo rapid and intense. Stirring stuff! Trk. 2) “There's Always Work” is a short instrumental, a double-tracked harmonica huffs and wails while Mayall, Vernon and Dudgeon, drenched with reverb, moan in the background. An interesting aural experiment, but at 1min. 58secs, it's really little more than an interlude. Trk. 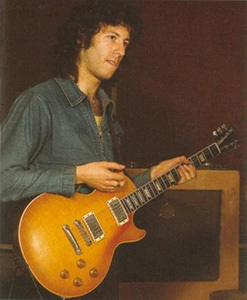 3) Peter Green's second vocal track on the album, “The Same Way,” is one of his own songs, a stop-start number that combines the usual twelve-bars and three chords in a very different way. His vocals, though mixed down, show great feeling and authority, and Mayall's harmonies blend well on the chorus. Two rhythm guitars beef up the beat, while Green's sensitive solo is both carefully constructed and excellently executed. Top Marks! Trk. 4) Peter's second original is a stunning instrumental, appropriately titled “The Supernatural.” He refused to take all the credit, saying “ Mike Vernon came up with the idea... he said he'd seen this guitarist who'd played a high note, sustained it and then let it roll all the way down the neck. But I played it and I decided on the sequence." Exploring his fascination with the Minor Rumba, which he'd use again for “I Loved Another Woman,” and “Black Magic Woman,” Green created a work of spine-tingling beauty and elegance. Dunbar plays with timpani mallets, muting the drums (as Mick Fleetwood did later on Green's other great instrumental, “Albatross”) and McVie locks in with a warm, sinuous bass line, while in the background Mayall picks out counter-melodies on the organ. Green's guitar, each ringing note wrapped in echo and reverb, is supremely eloquent, and his phrasing impeccable. It wasn't without foundation when Mayall told Beat Instrumental, "In Peter Green we have a replacement who is a young genius... for my money he'll be better than Eric." An entirely unique piece, and a pointer to the power of Green's imagination, as well as his playing. Trk. 5) Mayall's 5-string brings in a relaxed shuffle, “Top Of The Hill,” where he repeats the trick of adding his own vocal harmonies on the chorus. His tinkling piano is also in evidence, and to maintain the laid-back feel, Dunbar avoids the snare drum, keeping time on the tom-toms. Green's tasteful solo succeeds as much on what he leaves out as what he puts in, and this unassuming little twelve bar very soon grows on you. Nicely done. Trk. 7) Mayall's old 9-string sounds just a little out-of-tune on “Living Alone,” a track which also features him on vocals, keyboard and harp. Dunbar creates an unusual, lolloping pattern that McVie mirrors with a bouncy bass line, but Green seems to have been excluded, as Mayall sings about “living alone with my blues.” Perhaps there's some foreshadowing of John's venture into self-reliance, as evinced on his 1967 solo album “The Blues Alone,” on which drummer Keef Hartley is the only other musician. 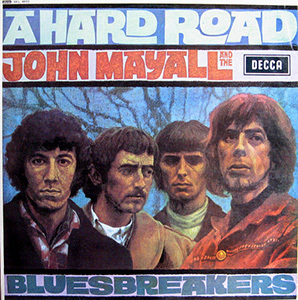 Rolling Stone boldly announced “A Hard Road” was "by far the best album ever put out by a white blues band, and should continue to be the same for quite some time," while Melody Maker predicted, "These four very talented English Bluesmen... are gradually going to become increasingly more important in the structure of British popular music." They might have easily added “but not necessarily in the same band,” as within a year Green had formed his Fleetwood Mac and Dunbar his Retaliation. As with Clapton the year before, a lot of attention has been paid to the equipment that the “Green God” used to achieve his signature tones, but since he was also using a Gibson Les Paul, could there really be any difference? For the anorak enthusiasts, apparently, yes. 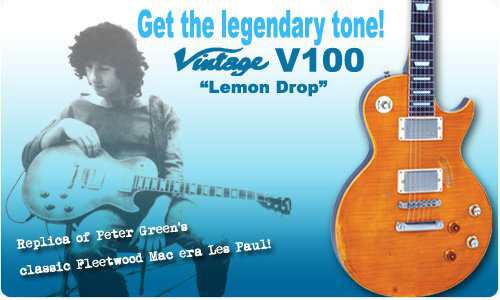 Evidently the famous “Lemon Drop” Gibson had a reversed neck pick-up, which not only appears "backwards" (with the pole pieces facing the bridge rather than the fingerboard) but had also been rewound (perhaps by mistake?) to reverse polarity. The reversed pick-up gave Green a distinctive “out-of-phase tone” when both pick-ups were used together, which has been copied by countless other players and manufacturers since. Nonetheless, the final word must belong to Peter himself, who more recently commented “If I had to do it again, I would've kept the guitar I had. It was a Harmony Meteor. It was much better for Blues than the Les Paul was."